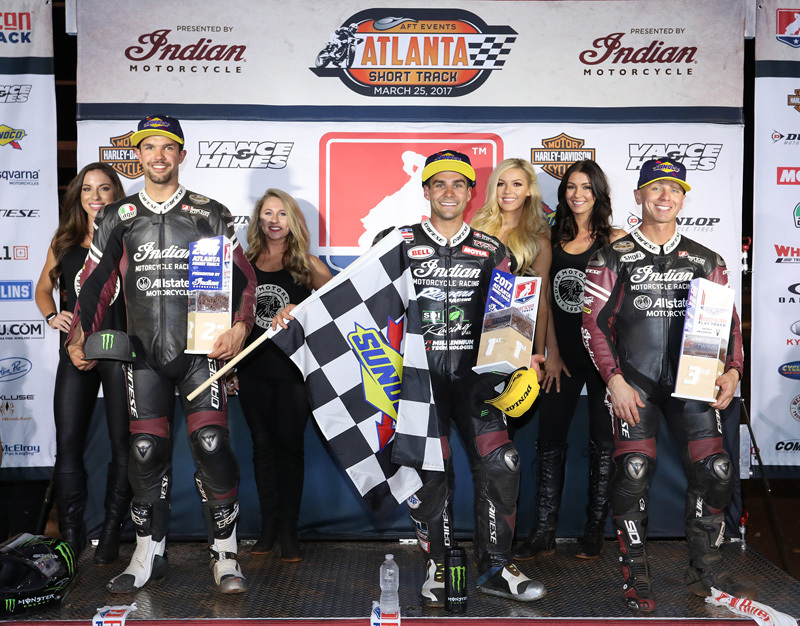 WOODSTOCK, GA (March 27, 2017) – Indian Motorcycle Racing continues its remarkable return to American Flat Track, as Jared Mees, Brad Baker and Bryan Smith sweep the podium at the Atlanta Short Track with 1st, 2nd and 3rd place finishes, respectively. Mees and Smith earned their second trip to the podium in as many weeks, as the two finished 1st and 2nd, respectively, at the Daytona TT season opener. 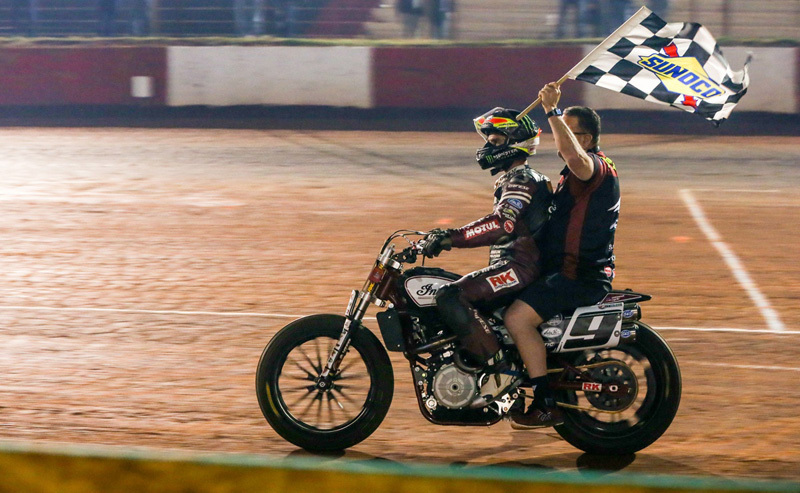 In what has already been a historic return to flat track racing, Indian Motorcycle tallied five of six podiums to start the 2017 American Flat Track season, following the sweep in Woodstock, GA. Equipped with the Scout FTR750, Indian’s “Wrecking Crew,” is living up to its legendary nickname that pays homage to Indian’s race team from the sport’s early days. Mees ran second for the majority of the race, stalking #69 Sammy Halbert and waiting for the right time to make a move. With six laps remaining, Mees dove inside of Halbert to move into first. But Halbert would not be easily denied, and the two veteran riders began a heated battle, diving inside of each other to exchange first and second positions. The battle ended with the two making contact, sending Halbert sliding into the wall and forcing a late red flag. From the restart, the final five laps seemed merely a formality with the Wrecking Crew running first, second and third to a historic finish. Mees also achieved a personal milestone, scoring his first AFT Short Track victory to complete the elusive dirt track Grand Slam. By winning a mile, half mile, short track, and TT Mees joined exclusive company in the annals of flat track racing. Opening the year with a victory at the DAYTONA TT – his first TT triumph – Mees is now halfway to earning a dirt track Grand Slam in consecutive races, something that has never been done in the 64-year history of the sport. “It’s for moments like this we reintroduced Indian Motorcycle back to flat track racing,” said Gary Gray, Product Director for Indian Motorcycle. 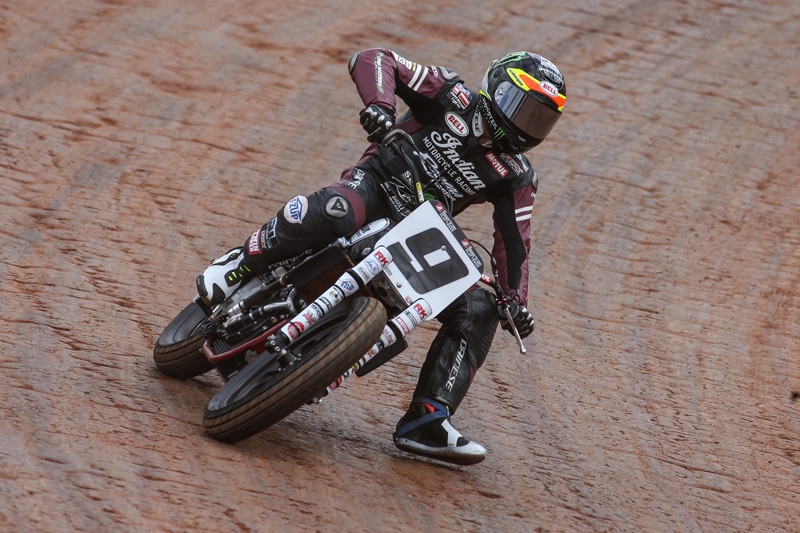 “We’re extremely proud of the team and thankful for all the preparation and execution, but it’s a long season and there’s plenty more racing.” Indian Motorcycle Racing, backed by Allstate Insurance, will look to stay on top as American Flat Track heads to the Charlotte Half Mile on Saturday April 1st.